In my last post, I talked about how homemade honey graham crackers could really elevate your baked good. In this post, I prove it. Folks, meet this miniature cheesecake from San Francisco's famed Miette bakery. It's made with a crust from homemade honey graham crackers and is living proof that the extra step of homemade crackers is worth it. Well, let's take a quick poll. How many people here have made what they thought would turn out to be a beautiful cheesecake, only to pull it out of the oven and be greeted with a cracked and puffy top? I know I have. Last year, after laboring for hours on a cheesecake for Thanksgiving dinner with my boyfriend's family, I was disappointed when I pulled it out of the oven. The cheesecake was overinflated and puffy, completely opposite from the smooth and creamy cheesecake I had expected! What's worse, as the cheesecake cooled, giant cracks appeared on top of the cake. I had to scramble last minute and hide the top with mixed berries and rose petals. It tasted delicious, admittedly, but cheesecakes are supposed to be beautiful. Wasn't there a recipe that could be both? One that could produce a creamy and delicious flavor, with a perfectly smooth and unblemished top? So, I rolled up my sleeves and started googling up a storm. There was a LOT of advice out there on how to get the perfect cheesecake. The advice ranged from sensible (make sure all your ingredients are at room temperature so that they fully incorporate with one another during the mixing process) to flat-out ridiculous (specifically, somebody out there has a theory that smooth cheesecakes are actually just frozen custards???). 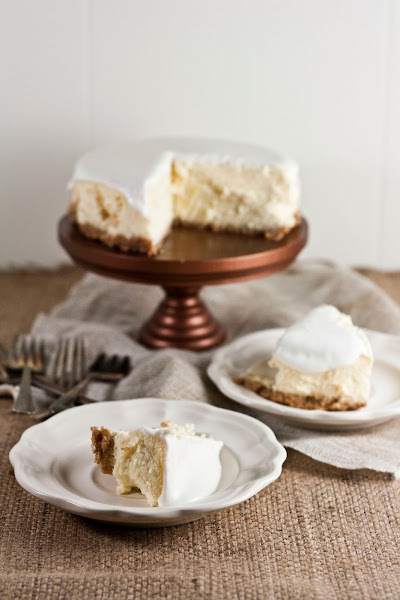 Feeling overwhelmed, I decided to take a look at popular cheesecake recipes. And that's when I started to notice patterns. First, all the famous cookbooks and chefs recommended baking a cheesecake in a bain-marie; that is, a warm water bath. Baking items in a water bath is a neat trick since it does a couple of things. First, it brings the cake's temperature up quickly. Second, it allows the cake to bake evenly throughout the baking time. Third, it allows for a more constant baking temperature since water in a bain-marie will remain at a constant temperature (somewhere around boiling). According to my sources, it's really quick changes in temperature that cause cracks — controlling your temperature through a bain-marie is an easy way to prevent fluctuations in temperature and warm spots in your oven. The other constant I noticed throughout the recipes was their emphasis on NOT overmixing the batter. 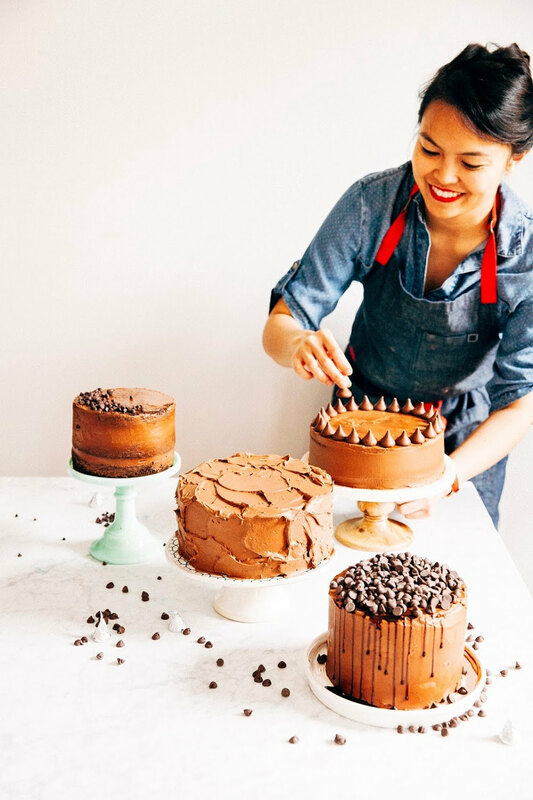 Overmixing causes too much air to enter the batter — it's the same air that tries to escape during the baking process and cause the cake to crack. Most cheesecakes involve a creaming process with the cream cheese and sugar before adding the eggs. 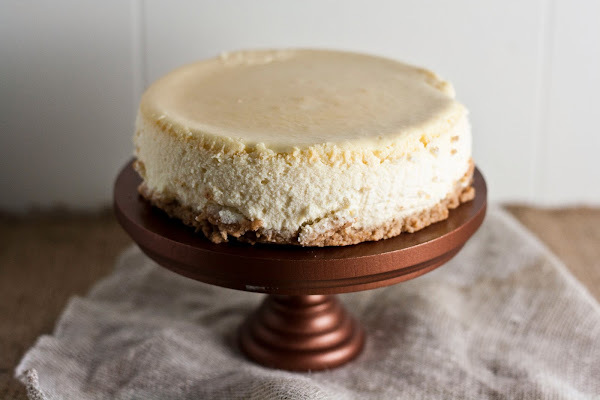 The creaming process incorporates air into the cheesecake, so it's important it still gets a good creaming process to give the cheesecake a light and fluffy texture. But don't overbeat the batter once adding the eggs — that's where the danger really is. Simply beat the eggs on a low speed only until they've been incorporated, making sure to stop the mixer once they have. With this in mind, I decided to try a cheesecake recipe from Miette. 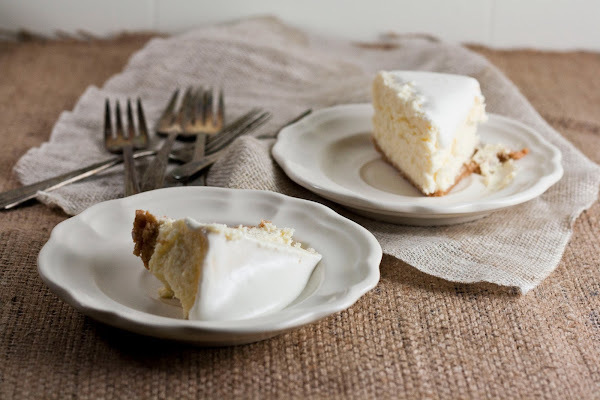 Not only was Miette one of San Francisco's most beloved pastry shops, their recipe for cheesecake was simple and emphasized both values I described above. It was no surprise that the cheesecake came out beautifully. Despite the fact that the cheesecake's top had no blemishes to hide, I decided to follow the recipe's instructions and top it off with a sour cream glaze. I was not disappointed — the sour cream was perfectly tart and creamy, a great complement to the cheesecake's rich flavor and fluffy texture. Note, however, I use the word "miniature" to describe the cheesecake recipe. Miette is famous for making small cakes; for instance, this cheesecake is baked using a 6-inch springform pan. Six inches is a modest amount – my boyfriend and I finished nearly three-quarters of the cake in one sitting. Great for your waistlines, but maybe not your appetite. Because believe me when I say you'll want as much of this cheesecake as you can get. From the homemade honey graham cracker crust to the perfectly smooth top, this cheesecake is a dream come true. Put 3/4 cup graham cracker crumbs in a 6-inch springform pan and press in an even layer on the bottom. Bake the crust until dark golden brown and firm, about 8 to 10 minutes. Transfer to a wire rack and let cool. Leave the oven on. When the crust is cool, wrap the bottom of the pan with aluminum foil. This will prevent the water in the bain-marie from entering the pan during baking, so be sure to wrap it tight. I would even do a double-layer. Make sure the foil wraps at least halfway up the sides of the pan. In the bowl of a stand mixer fitted with the paddle attachment, beat 1lb cream cheese on medium speed until fluffy. 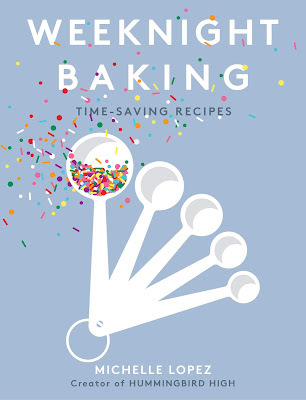 If you’re using a KitchenAid mixer, I recommend setting the speed to 6 and beating for 4 minutes — the goal of this process is to get rid of the lumps and make the cream cheese smooth and creamy, but without adding too much air. As stated above, air will make your cheesecake’s top crack. Gradually add 1/2 cup sugar and beat until smooth. Stop the mixer. With the mixer set on low speed, drop 2 eggs one at a time into the cream cheese mixture. Beat each egg until thoroughly incorporated before adding the next. Slowly drizzle in 1/4 cup heavy cream before adding 3/4 teaspoon vanilla and beating until smooth, about 4 – 5 minutes. Slowly strain the batter through a mesh sieve strainer into a clean bowl, then pour onto the cooled crust. Place the filled cheesecake in a 13 x 9-inch baking pan. Carefully pour the boiling water into the larger pan to reach halfway up the sides of the cheesecake pan. Bake for about 1 hour and 30 minutes, until the filling is set and just barely jiggles in the center. 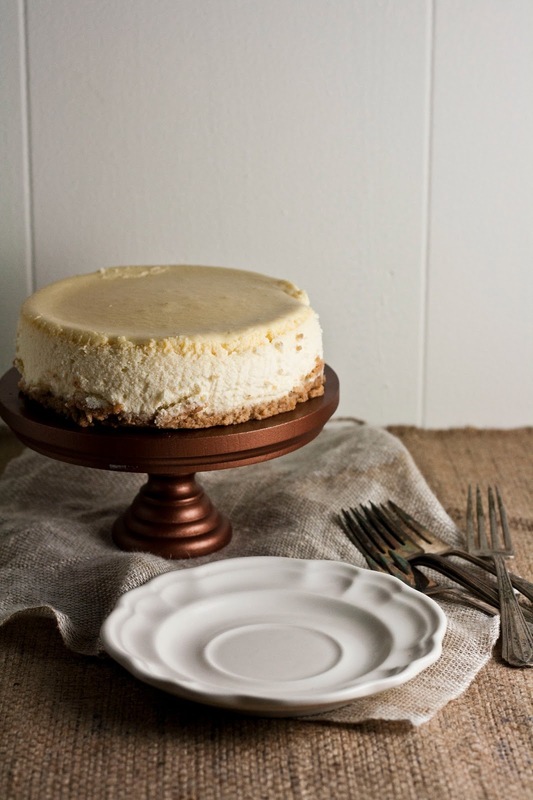 Place the water bath on a wire rack to cool completely — leave the cheesecake pan in the water bath to allow the cheesecake to cool to room temperature slowly. When the cake has cooled completely, make the glaze by combining 1/2 cup sour cream and 1 tablespoon sugar to a small bowl and whisking to combine. When the sugar has been fully incorporated, spread the mixture over the top of the cooled cheesecake. Wrap tightly with plastic wrap and refrigerate for at least 2 hours and up to 8 hours (I skipped this step, that’s why my sour cream topping looks runny — in actuality, in should sit on top of the cheesecake and look like it’s part of the cake). Remove from the fridge and let thaw for 30 minutes before serving. To de-pan and serve, unlatch the springform pan and use an offset spatula to loosen the crust from the pan and transfer to a cake board. This cheesecake looks fantastic! I like that it's a 6-inch cake. And I like the tartness of sour cream glaze. Thanks for some great tips! 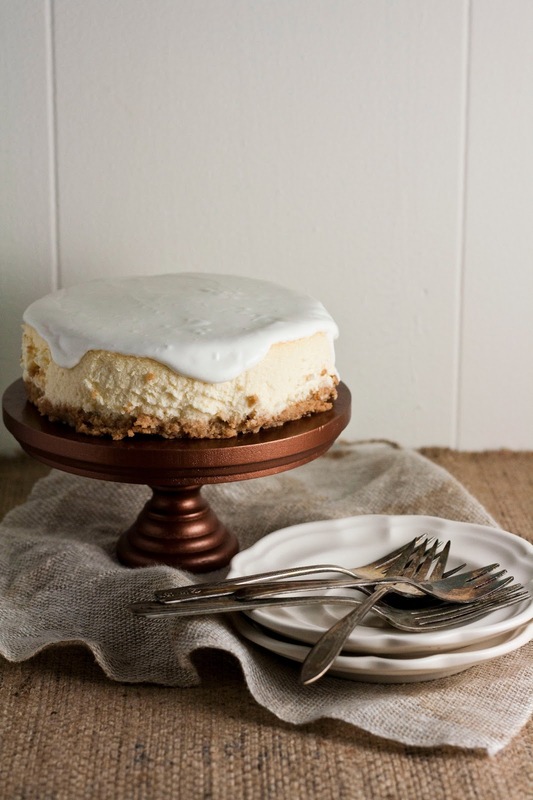 Thanks for sharing this recipe, your cheesecake does look perfect! I feel compelled to comment because cheesecake is one of my all time favorites. I've been looking to switch up mine and I feel like heavy cream will be the perfect addition. I'm already prepping to try this tonight along with the honey graham crackers. Also, I assume if I'm making this in an 8" tin it will be a little flatter, right? Thanks anyway! All compliments from tonight's dinner party will be forwarded to you, yes? I've never made it in an 8-inch baking pan, but yes, I assume it will be flatter. Let me know how this works out for you! This is adorable and I love Miette! 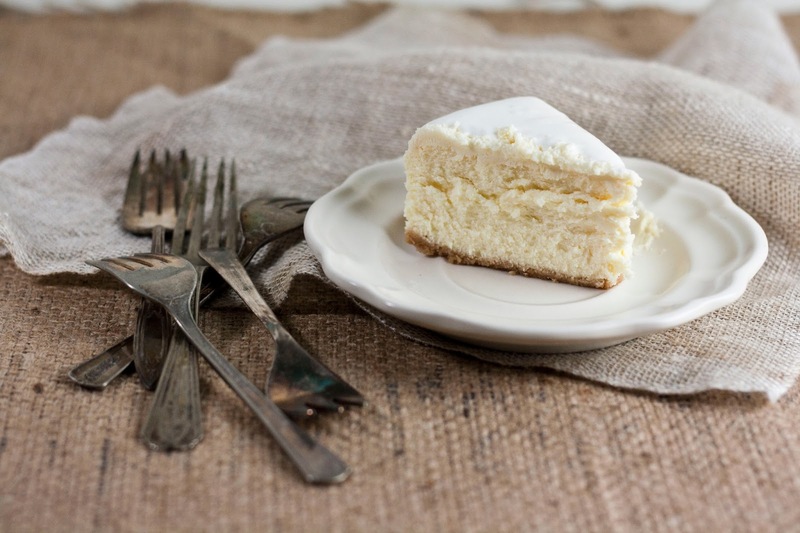 Cheesecake is one of my favorites so I'll have to try this soon. Sidenote: I found this blog through the Saveur Food Blog Finalists so congrats! Made it yesterday, it turned out so perfect! Thanks a lot for the recipe! The bain-marie really makes the difference.